Their children are now 4 years old, 2.5 years old and 2 months old, meaning that Daria has been breastfeeding almost nonstop for the last 4 years. She nursed her eldest son for 1 year and 3 months, her middle daughter for 2 years and 3 months, and her new baby girl has been exclusively breastfed for the 2 months since her birth. 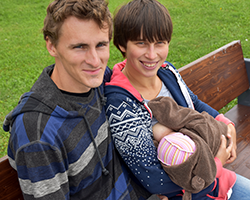 Viktor has taken on the role of Daria’s partner in all aspects of parenting, including breastfeeding, which made adapting to and learning the process of breastfeeding much easier for everyone. For example, he takes care of the children in the first part of the day to help Daria get enough sleep and rest after a night of nursing, and to have enough time for herself. Breastfeeding is a vital part of healthy child development, and the best start to life for any baby. During World Breastfeeding Week, which takes place on 1–7 August each year, WHO celebrates the benefits of breastfeeding and raises awareness about this essential part of every person’s life course. introduction of nutritionally adequate and safe complementary (solid) foods at 6 months together with continued breastfeeding up to 2 years of age or beyond. In 2006–2012, only approximately 25% of infants in the WHO European Region were exclusively breastfed for the first 6 months, in comparison to 43% in the WHO South-East Asia Region. Although the figures vary substantially across the Region, the average rate of exclusive breastfeeding remains far below the global recommendation. Even though early initiation of breastfeeding is very common in some countries, exclusive breastfeeding rates drop rapidly between 4 and 6 months of age and are very low at 6 months. When asked about the value of breastfeeding, Daria enthusiastically cites a long list of benefits for both mother and baby. In addition to the health benefits noted above, she refers to the psychological benefits for the child, such as reduced anxiety, and the quality of the mother–baby relationship that breastfeeding, in her experience, helped to establish. She also points to the convenience and the economic advantage. Daria grew up hearing about the misconception that children who are breastfed too long grow up to be needy and dependent. But her experience has been the opposite – breastfeeding helped her children feel safe and secure, and both of her older children are inquisitive, brave and independent. While Daria is enthusiastic about the value of breastfeeding, she stresses the importance of doctors and nurses showing a strong commitment to supporting breastfeeding mothers. She acknowledges that health professionals inform young mothers of the benefits of breastfeeding and explain that the first nursing should happen shortly after birth, but she says this could be improved. Daria has also had the experience of asking questions about breastfeeding and receiving answers that were confusing and not evidence-based. Fortunately for Daria, she has been able to gather a supportive community of other parents around her. She also found many doctors and nurses who supported her decision to breastfeed and helped her family to establish healthy nursing routines for all 3 children. As for attitudes to public breastfeeding, Daria says that there have been very few instances when she felt unwelcome – just twice in the last 4 years has someone explicitly asked her to stop breastfeeding in public. She wishes that people could more fully embrace breastfeeding for what it is – a natural and vital part of a baby’s healthy development, with benefits for the whole family.